Do you think you have what it takes to build a luxury brand in the Caribbean? If so, this may be the perfect opportunity for you to unleash your brand management potential! We are looking for a marketing ‘guru’ with a fun and energetic personality to take our Blue Sky Luxury brand to the next level! We are a luxury holiday rentals brand with a vast portfolio of villas and condos along the west coast of Barbados, and as the ‘brand guardian’ you will be tasked with maintaining the integrity of the brand across all marketing initiatives and communications. This is an excellent opportunity for you to join our marketing team. 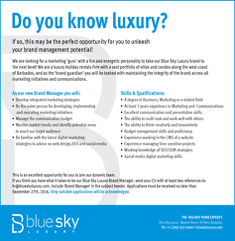 If you think you have what it takes to be our Blue Sky Luxury Brand Manager, send your CV with at least two references to: careers@blueskyluxury.com. Include ‘Brand Manager’ in the subject header. Applications must be received no later than September 27th, 2016.